Surface Acoustic Wave Touch Screen, SAW Touch Screen. 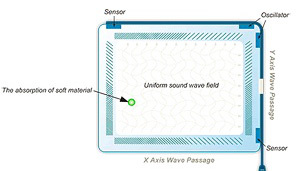 Compared to other types of touch screens, SAW (Surface Acoustice Wave) touch screen offer better performance. Since the panel picks up input with the slightest touch, it is easier for the user to operate. In addition, as physical contact between users' fingers and the touch screen is not required, the panel experiences significantly less wear compared to other conventional touch screens and therefore offers high stability. Results of machinery test indicate that the lifecycle for SAW touch screens can be aslong as 10 years. The fact that the entire product deploys one single PCB with dense chip clusters along with the absence of multiple components, enables high product consistency and yield rate. High transparency. Light transmission is up to 90%. Affecting by EMI lower than other types of touch screens. 7H high hardness tempered glass with Vandal-Proof and Anti-Scratch. Operating by finger or soft materials. The longest lifespan in all of touch screen. Customized from 8.4" to 32". Response time less than 10 ms.
As the manufacturing process for SAW touch panel involves relatively more steps, coupled with sophisticated driver IC and circuitry, the product is rarely used for middle - small form factor products due to the costs and technical limitations. Such touch screens are often used for high priced products with display devices over 10.4", such as information kiosks at public places and bank ATMs.